Earlham is a residential college of about 1,100 students, and its beautiful campus is located on 800 acres in the city of Richmond, Indiana. It’s about an hour’s drive from Indianapolis, Cincinnati, and Dayton. Earlham offers 46 academic programs and provides excellent pre-professional preparation for Business, Health Care, Engineering, Law, Teaching, and the Peace Corps. Earlham students study, research, and hold internships in locations across the United States and around the world. Earlham alumni are making an impact throughout the world as scientists, teachers, lawyers, ministers, executives, physicians, writers, and organizational leaders. The student-faculty ratio is 9:1, and 70% of classes have 15 or fewer students. Faculty and students are on a first-name basis in order to emphasize that they are partners in learning. 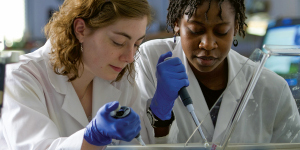 Most faculty members have completed research with students. Students are involved in more than 60 student organizations. The Earlham community is also renowned for its engagement in community service and social justice. The College is a member of NCAA Division III and participates in baseball (M), basketball (M/W), cross-country (M/W), field hockey (W), golf (M/W), lacrosse (M/W), soccer (M/W), tennis (M/W), track & field (M/W), and volleyball (W). In recent years, Earlham has invested more than $70 million in new or renovated buildings, including a student center, science facilities with state-of-the-art research labs, a center for visual and performing arts, and baseball and soccer stadiums. With a distinctive focus on collaboration and hands-on learning—including funded internships or research opportunities for every student—Earlham College prepares graduates for lives of purpose and accomplishment. 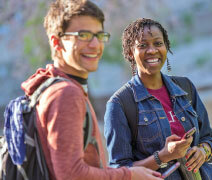 What brings students to Earlham? For starters, a world-class faculty. Earlham is renowned for its unusually strong commitment to undergraduate teaching, ranking seventh nationally for “Best Classroom Experience” by The Princeton Review, among other accolades. What course will you set? Peace and Global Studies? Environmental Studies? Neuroscience? Maybe you’ve never heard of Border Studies or encountered a major in Human Development and Social Relations. At Earlham, you will.The College’s program offerings will introduce you to new concepts and ideas and even carry you to new lands and continents. Earlham is known for producing graduates who engage the world’s most challenging problems with both practicality and optimism. Earlham has shaped its curriculum through an initiative called EPIC, the Earlham Program for an Integrative Curriculum, in order to best support and prepare students. A key component of this initiative is the EPIC Advantage, Earlham’s commitment to fund an internshipor research experience for every student. EPIC is also designed to help students connect disparate experiences—like an internship, a summer research experience, an off-campus program, traditional course work,and even extracurricular activities—into a comprehensive experience. Among the core features of EPIC isthe Integrated Pathway. Besides choosing a major, students also select a set of four to six thematic courses, called anIntegrated Pathway (IP). The IP experience is designed to help students make intentional connections between their academic interests and possible careers. A global perspective comes naturallyto the campus community. Earlham is ranked fifth by U.S. News & World Report among liberal arts colleges for its percentage of international students enrolled. 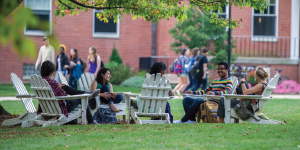 With such a variety of students, campus life at Earlham is both lively and welcoming. Earlham embraces cultural and individual differences alike and offers unparalleled opportunities for leadership, friendship, and community. • Graduates from the past five years have earned such prestigious awards as the Rhodes Scholarship, Fulbright Scholarship, the Watson Fellowship, the National Science Foundation Pre-doctoral Fellowship, the Samuel Huntington Public Service Award, and a Fellowship at the Carnegie Endowment for International Peace. • Of all colleges and universities in the United States, Earlham also ranks in the top 2% for its percentage of graduates who go on to earn research doctorates, a distinction that demonstrates the level of academic quality and mentoring at Earlham.